Davidoff Nicaragua (code name Davidoff Black) cigars were 10 years in the making, but decidedly worth the wait. Ten years of preparation, curing, and aging allowed the time necessary to tame the wilder tendencies of Nicaragua tobaccos, and to deliver a blend with all the intensity, excitement, and refined sophistication you expect from Davidoff. The 10-year old Nicaragua Rosado wrapper envelops a Habano Jalapa binder and Esteli Viso, Condegas Ligero, Ometepe Viso, and Esteli Ligero filler blended to perfection. 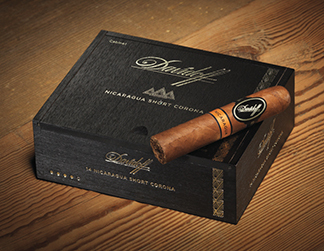 The mild to medium-bodied Davidoff Nicaragua cigar is very flavorful and well balanced, delivering a rich and earthy aroma and flavors of white pepper, earthiness, roasted coffee beans, dark bitter chocolate, and creamy sweetness to stimulate both the bitter and sweet taste buds. Handmade in the Dominican Republic under Davidoff's demanding quality standards, the incredible construction of the Davidoff Nicaragua offers a flawless draw and burn. Take one unforgettable journey with this puro and you will return time after time.